Chicken Skin Music always reminds me of my discovery of traditional Hawaiian music. In 1976, after reading the liner notes on the inner-sleeve back, where Cooder writes he recorded two numbers with Gabby Pahinui and Leland Atta Isaacs in Hawaii, I searched out and found copies of Gabby on Panini PS 1002 and later, Gabby Band on Panini PS 1008 and The Gabby Pahinui Hawaiian Band on Panini 1007. 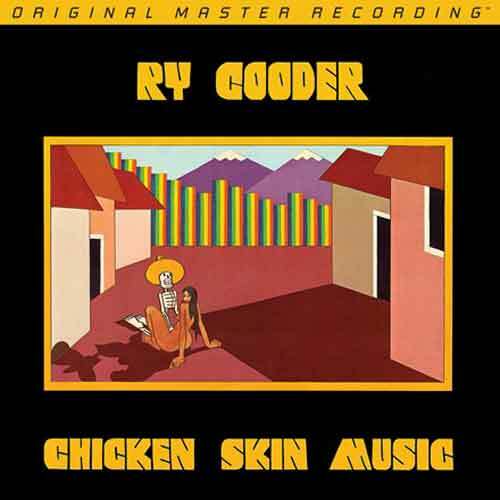 Cooder plays on the latter albums, both recorded not long after this LP. One of Robert Altman’s masterpieces, Short Cuts is based on a series of nine short stories and a poem by Raymond Carver. The nine songs on this album fit the humorous but compassionate tone of the movie. Musicians Lyle Lovett, Tom Waits, Annie Ross, and Huey Lewis help fill out the star-studded cast. With apologies to Mark Isham’s fine soundtrack, the mix of cultures and styles of Cooder’s music mimic the rich polyglot culture of Altman’s vision of Los Angeles. Nobody does eclectic like Ry Cooder—be it the blues, jazz, Tex-Mex, Indian, Hawaii, Cuban, African. You name the style and it seems like Cooder has done it. At the time of this writing, Cooder is reprising his 2017 tour with Rosanne Cash, playing all Johnny Cash material. He knocked it out of the park during the first go around. Such full-on eclecticism sounds akin to a recipe for disaster, like a little too much “world” in your music, but it works for him and works on a level of consistency few artists achieve. Sometimes he bites off a manageable helping of influences, as with A Meeting by the River or Buena Vista Social Club. In those situations, he spotlights a specific artist or group of artists. Generally, however, when he’s the lead, anything goes. Throughout his career, Cooder has managed to maintain a track record of producing consistently great-sounding LPs. One day, about a dozen years ago, I was doing my weekly search through the bins at my local record store and noticed another collector doing the same along the same row in the jazz section, heading towards me from the other direction. I looked over and recognized it was Cooder. That day, I confirmed he knew his stuff about collecting just as well as he does about recording. All of Cooder’s Warner Bros. releases feature stellar sonics, while his A Meeting by the River on Water Lily Acoustics and Buena Vista Social Club on Nonesuch double as reference discs. Mobile Fidelity’s reissues of several Warner Bros. titles have bumped the likes of Paradise and Lunch up from great-sounding to demonstration quality. While the original pressing of Chicken Skin Music always appeared to sound very good, in comparison to the new pressing, it now seems a bit thin in color and texture. On the Mobile Fidelity LP, the soundstage is wider and the space in between and around the instruments more convincingly filled. String and horn sound, in particular, offers more stability and blooms with a fuller color palette.